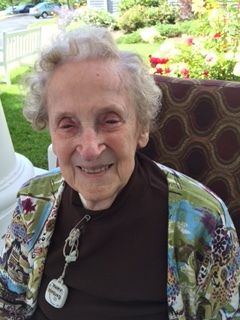 Mrs. Mary Lillian Richard Haddad, age 98, of 317 Melbourne Place, Pittsfield, died Monday afternoon. She was born in East Brookfield, MA, April 17, 1920, the daughter of the late Adolph and Sophie LeBlanc Richard. She attended the schools in Dalton and was employed initially at the former Dale Bros. Laundry before becoming employed at J.J. Newberry's and later at the General Electric Co. She and her late husband, Alfred, had a variety store at the corner of Burbank & Tyler Street, and they later moved to the corner of Dalton Ave & Tyler Street where they opened a card and gift shop with a luncheonette. Upon the sale of the business in Oct. of 1977, they moved to Vermont, where they both worked for the Cleveland Dodge family, retiring in June of 1988. After retirement they lived in Bennington where Mr. Haddad died in 1998. Mrs. Haddad returned to Pittsfield in 2006. A former communicant of St. Agnes Church, she attended St. Francis Church and Sacred Heart Church in Bennington, VT. A member of the Benevolent Association for the Blind here, she had been a member of the Vermont Association for the Blind and Visually Impaired. Mrs. Haddad was a former member of the Lebanese Bowling league in Pittsfield, a member of the Daughters of Lebanon, and she enjoyed knitting blankets for the disabled. She and Alfred L. Haddad were married Sept. 30, 1939. Al died April 24, 1998 after 58 years of marriage. She is survived by her daughter, Serena and husband Donald Johnson of Largo, FL, her son Michael Alfred Haddad and wife Jane of Charlotte, NC, her 8 grandchildren, 12 great-grandchildren, 4 great-great-grandchildren, 3 nieces, and 5 nephews. She was predeceased by her daughter, Judith A. Haddad MacFarlane Holmes, who died Oct. 4, 2014, her granddaughter, Stacey MacFarlane Holmes, who died Aug. 28, 2011, her grandson, Michael Allan Haddad, who died March 16, 2016, as well as her two sisters, Regina Richard and Rita Vella. SERVICES: Mary Lillian Richard Haddad, age 98, of Pittsfield, died June 25, 2018. Calling Hours at the DEVANNY-CONDRON FUNERAL HOME will be FRIDAY, June 29th from 4 to 7 pm. Funeral services will immediately follow at 7:00 pm with the Rev. Msgr. Michael A. Shershanovich, pastor of St. Joseph's Church, officiating. The family will receive friends again on SATURDAY morning June 30th at the funeral home beginning at 9:15 am with burial to follow in St. Joseph's Cemetery. In lieu of flowers, if friends desire, memorial donations may be made to the Berkshire Benevolent Association for the Blind In care of the Funeral Home.